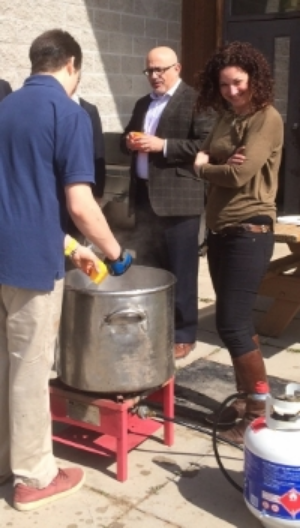 On a sunny day in April, Deputy Minister Alex Bezzina and Assistant Deputy Minister JoAnn Miller-Reid spent a couple of hours with us at the Pine River Institute campus near Shelburne, Ontario. It is always gratifying when people make the effort to visit our campus a few hours outside of Toronto, and see for themselves just how our program works. We truly appreciate the opportunity to share it with them. Our guests learned first-hand from our Clinical Director, Dr. Victoria Creighton, about our maturity model, the phases within the program, variable length of stay, and working with the whole family. They heard from Dr. Laura Mills, Director of Research & Evaluation, about our on-going outcome evaluation, and the many collaborative projects in which she is involved or leading. Our CEO, Vaughan Dowie and John Fallis, Executive Director of Operations provided an overview on a number of issues, and all engaged in meaningful discussion about the need for residential treatment for youth in Ontario. Two current Pine River students joined the conversation, and shared their experience of the program. Both were eloquent and honest about their challenges and how Pine River has helped them and their families to heal and grow. Our tour of the campus concluded with a tasting of the students’ maple syrup, its production in progress. Newer PostHELP PINE RIVER FOUNDATION WIN $10,000 THROUGH THE GREAT CANADIAN GIVING CHALLENGE!